On this smart pedal go-kart your toddler will learn to scoot and pedal much faster. 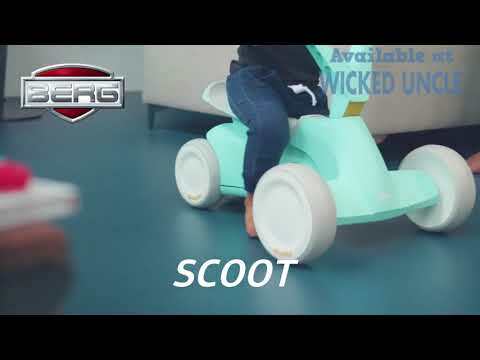 With a sleek ergonomic design, the four wheels on this lightweight, innovative ride-on keep it firmly grounded, so that your little one can learn to scoot easily. When your child is ready for the pedal stage, simply fold down the integrated pedals for smooth and easy light pedalling, due to the ball bearing crankshaft. Grows with the child, so there is no need to adjust the seat or steering, with textured saddle and grips, carrying handle and silent whisper tyres for quiet indoor and outdoor use. Scoot, Pedal and Grow! Recommended from 10 months to 30 months - makes a lovely christening or First Birthday present.